In the times of rapid development of technologies, various devices receive new features and upgrades, until recently not completely inherent to them. For example, recently, the phone, radio, player, camera and TV were separate devices. Now all these, and not only, are united in one, which is freely and invisibly can easily fit in your pocket. Such a universalization also touched development of technologies in the entertainment industry. If before we considered the light control panel only as a means of controlling stationary lighting, now more features were added to its functions: the management of pyrotechnic effects, the reproduction of video content, the position and direction of video cameras, the switching of video cameras, space tracking, the launch of music phonograms, etc. 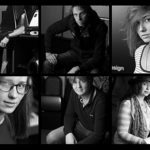 All of these new features of light control panels are not just a whim of developers of the equipment or a tribute to fashion, but it’s rather demands of time. Television shows and theatre performances are becoming more spectacular and technically sophisticated with usage of variety of means to create audiovisual effects. And it so happened that light consoles were destined to become the central devices that unites and synchronizes all of these tools. The DMX512 Lighting Control Protocol has so many tasks now that 30 years ago the developers of the protocol could not even imagine this many. 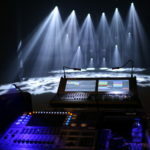 If at the time of the establishment of the protocol management system of staged lighting was operated by dozens of channels, then for modern shows, the needed control systems have dozens of DMX spaces. It was difficult for manufacturers of control systems to extend the number of control channels while ensuring compatibility with a vast fleet of equipment already in use, leaving within reasonable limits the number of cables and network equipment. To help developers came IT-technologies. The idea of combining dozens of DMX streams and transmitting them using the Ethernet network proved to be quite successful. Firstly, because it allowed to significantly simplify the topology and reduce the number of cables and network equipment, and secondly, allowed to use cheap and widespread items that construct information networks, and thirdly, due to significant developments in the field of data flow processing, it was possible to simplify the routing and reservation of data. How to build an Ethernet-based management system, which components are needed to be used, and what benefits are provided by using the Ethernet network all of it will be mentioned in this article. Lets look at the construction of control networks based on the technical solutions of the Latvian company NA, which produces the full range of equipment needed to build control systems of various levels of complexity. A few words about the company itself. The NA company was founded in June 1994. The founders of the company at that time already had a great experience with the stage technologies, as they have been working in this field since 1986. Based on the company’s own experience in the renting and service segments, they united the efforts of the teams of designers, electronics, programmers, light designers, remote control operators and network technology specialists to develop and manufacture devices and consoles that met the requirements of the modern market of professional equipment. The DMX signal generated by the control panel must be converted to Ethernet by the ArtNET or ACN protocol. Most light control panels support these protocols and are equipped with an appropriate connector (like the light control panel 2, see fig. 1). 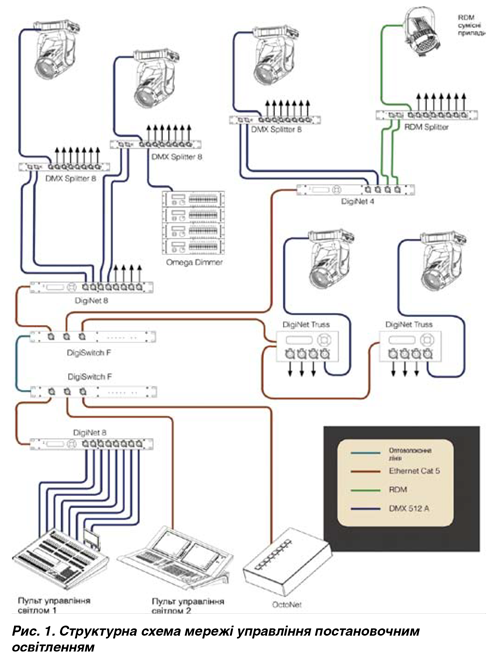 Boards which do not have an Ethernet-out (such as the light control panel 1, see Figure 1), or do not support the above-mentioned protocols, can also be connected to the network through the corresponding DMX-Ethernet DigiNet Converter, which has several modifications, which we will discuss below. 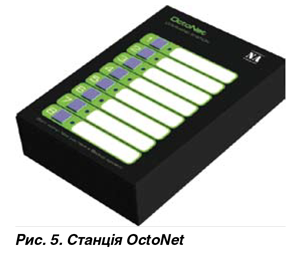 This device allows you to combine various manufacturers’ boards into the network to extend control capabilities, delineate tasks between different operators, and backup in case of failure of one of the remote controls. Consequently, signals from different sources are merged into the network using the Ethernet of the DigiSwitch shortcut, which acts as the router of data streams. For splitting the signal between different directions, DigiSwitch is used for data transmission over long distances – DigiSwitch F modification, equipped with an optical fiber port. The switch is made in a river shell (fig. 2), which allows mounting it to a standard 19″ rack and is equipped with 5 ports. Automatic matching of the flow rates allows you to adjust the optimal reception characteristics for each port. In addition, each one of the ports allows you to connect with a dual cable CAT5, which also increases the reliability of the network. 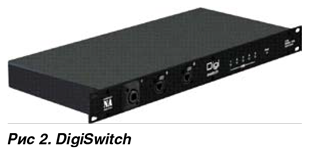 For reverse signal conversion from Ethernet to DMX512, a device called DigiNet is used, which, as it was already mentioned, is available in several modifications, and allows the user to select the device that best suits its needs. The first difference is the number of DMX outputs there are 4 or 8. Second one – a constructive execution: for mounting a 19″ rack (DigiNet and DigiNet 8), in the studio wall, or on the stage (DigiNet W), for installation on the farm (DigiNet Truss). The main characteristics of the devices are shown in Table 2. 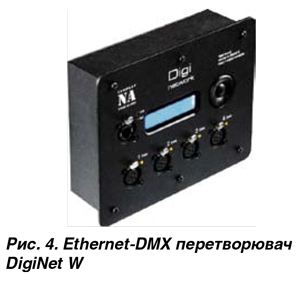 DigiNet devices are bi-directional converters from ArtNet / ACN to DMX with many other functions. 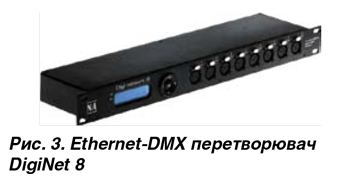 It has DMX-512 ports that can be individually configured as inputs or outputs, each of the DMX outputs can be assigned an arbitrary DMX space. from company NA as a source backup control signal. All DMX ports have a galvanic solution. All device settings can be done directly on the device with the keys and the built-in menu, or remotely, using the built-in web page. Software upgrade via Ethernet is possible. All connectors are equipped with LED status indicators. The light control panel, no matter how high it is, does not give one hundred percent guarantee of trouble-free operation, so for very important shows and direct broadcasts, is used reservation of the control panel. It is made by installing an additional remote control, usually the same as the main one. Consoles are united in one network, for program purposes one of them is the main one and second is the backup. If the main console has stopped transmitting data, the transfer of data is backed up automatically. But everything this is good when there is a required number of consoles, but how to get out of a situation where for financial, technical or some other reason, the installation of a backup remote is impossible. The above-mentioned function of DigiNet converters to record real-time output signals is a small additional feature that makes these devices different from many others, and provides users with the ability to create a backup source of control signals. Developers of NA added a line of means for building control lighting networks by another network device – the OctoNet pushbutton (Figure 5). The station connects to an Ethernet network and can control an unlimited number of DigiNet devices. The device allows you to record and play up to 8 light scenes. The interface of the station is very simple – 8 buttons with LED indicators. Press and hold for 10 sec. one of the buttons – and the current light scene is recorded. If during the show the console failed, operator has the possibility to switch to one of the 8 recorded light scenes with one click. This is not a complete replacement of the remote control, but it gives you the opportunity to win some time. Intuition or experience? 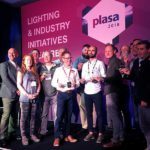 What is needed in the work of lighting artist?